So our P-day got moved to Thursday because we have a temple trip that we did this morning. So that's why y'all didn't hear from me Monday. I'll talk more about the temple trip next Monday. But ya, how's everyone doing? This week went by really fast and it's hard to believe that's it's already P Day! I hope everyone's been doing good back home! Kearns has been going great and I've had a lot of experiences this past week! Yesterday we had a Salt Lake City Regional conference which was really cool. It was two hours long but we were able to hear from Elder Ballard, from the 12 Apostles, which was great and he talked about Pokemon Go in his talk which was very funny! All the talks were great and it was awesome to hear from everyone who was there! But ya, it was a great week and we had a baptism this week! Last Saturday Omar got baptized by Elder Ruiz, who had been working with him before we moved to the Kearns Stake, and it was a great experience! Omar is a 17 year old Hispanic guy, who doesn't know Spanish, and he is a really cool dude and I'm so glad that he's been baptized now and has been coming to church. It's really cool to be part of people's lives and I love seeing the change people make so that they can finally know what true happiness and joy is! Besides the baptism we had a lot of spiritual experiences this week. One of which is this cool stake carnival that we went to! It was really cool and all the Samoans made some epic hot dogs that were really good! It was a lot of fun just to see everyone from the stake and eat and chill. They us and the Spanish Elders give a small presentation about missionary work which was fun. We didn’t have a very loud amp so it was kinda hard to communicate to everyone but it was really good! We basically talked about how it's not hard to do missionary work and we did a role play where I showed them how they could ask somebody out to church. It was really cool and they really likes it. But ya lots of miracles this week. After Omar's baptism it was 8:30 and we weren't sure how to finish our evening so we said a prayer to ask what to do. I immediately thought of one of our Ward referrals on the other side of the stake. After I said that Elder Dunham was like I was thinking the same thing! So we walked in the dark to this lady's house and it's like 9 at night and we knock. No answer so we knock again. No answer. We knock one more time with our fingers crossed. Then the window slides open and she pokes her head out and started talking to us. We ended up setting a return appointment to teach her. She said she has been coming to church and she's seems like a good person for us to teach so I'm excited for it. But ya, that's about all I did this week and it's been awesome here in Kearns. I have been having a great time so far and I'm learning so much! It's my first Labor Day away from home (I'm doing alright though) and today we have an all day P Day because of the holiday! So I get to email y'all all day today. My week was really good and went by fast! I feel like I just had P Day but it was great. We had probably one of the more successful weeks and it was miracle after miracle! 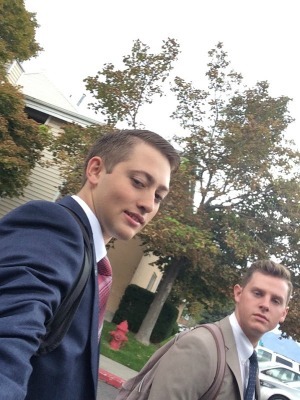 Elder Dunham went on exchanges with Elder Hernandez on Wednesday and me and him had a slow start. Because our washing machine broke last Monday!! So I have been running very very very low on clean clothes... But ya the guy that the mission office got to fix was an hour late... So we just watched some Mormon messages till he finally showed up at one. Then after twenty minutes working on it he said nothing was wrong with it. I threw in a load to see if he was right and it worked fine. So ya, we didn't get out till around 2 or 3. Once we got out we had a great evening. We got along really well and we taught two less actives. They were powerful lessons and we talked about spiritual CPR. Which is church, prayer, and reading. Both of them have been going through hard times and want to come back to church. We talked about praying about their situation and for God to fight there battles. Both of them were crying at the end and it was a humbling experience. Last Thursday we went in splits with the Elders Quorum Presidency of the Kearns 6th Ward to visit some less actives and to invite them back to church. I went with President Arnesen and everyone on our list to visit either had moved or said to go away. We prayed and choose a family who was anti Mormon to go by. We knocked on the door and I had no idea what to expect. A 17 year old guy answered the door and he let us in. He was one of the sons and the parents were gone with his sister practicing driving. We talked about coming to church and we had a great conversation. 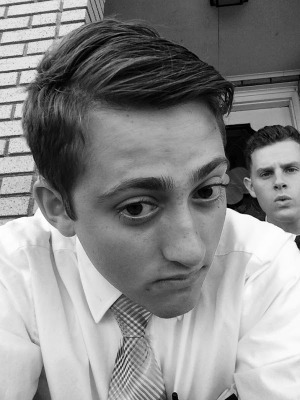 Then the parents came home and they came on and were like, "oh the missionaries" with big eyes. They sat down with us and we actually talked with them about coming out to church. It was nice and the spirit was there. It was a miracle even to talk with them! The Lord provides the way! Then later that day we were contacting people off the street near our apartments and we said a prayer and not five seconds later we run into this lady whom we previously talked to before but had brushed us off. She motions us over and starts actually talking to us. We find out she is a less active and she has a cousin moving in a few doors down who wants to be baptized and that she wants us to come and teach her and her daughter. It was an amazing experience! We'll be going by later this week! Saturday was so epic and I witness many miracles!! First once we got back we met with Paula and her two sisters and it was a great lesson. Once we got started we taught the Restoration from start to finish! Her sister Ci Ci said she would come to church and Paula has to work unfortunately... But that was a great lesson and we have both of the sisters reading and they said they would pray to God to see if Joseph Smith is a prophet. I'm pumped for them. Right after our lesson we went over to the Abrams and they have been having a real hard time recently. So it's a mom and her two boys with her husband gone in the military. We have been mainly teaching the son so that he can be baptized and his name is Jayin. We teach the whole family and recently her husband had a stroke and is currently in the hospital and is recovering slowly. He had some kinda brain damage from cancer on top of that. So it has been really hard in the mom and especially the boys. She can't even go see him because the registration sticker to her car are missing. She is a strong mom though and she shared this story with us. So she took her car to go to 7-11 real quick and come back and in the process she hits some one. The woman who she hit at first was angry but she told her story and the lady forgave her and when she got home the big dent in her car was gone like she didn't even get in a wreck. It was great to hear her testimony even in this troubling time, it gives me strength. 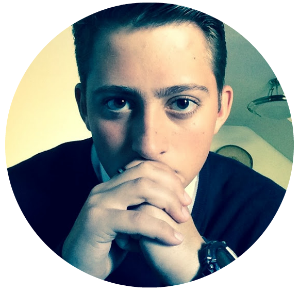 Knowing how much better I could be handing my small personal trials. It's a broader perspective for sure. That's why I love serving a mission is stories like that. We also taught the Greenfeilds. They are a new LA we just picked up and they are very similar to the Abrams. They had a rough path through out their life and at one point they were living off the streets but because of the kindness of one member they have slowly changed their lives for the better. 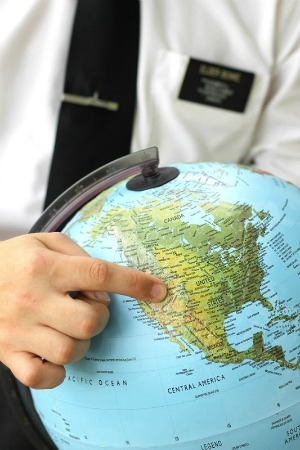 Every member a missionary. Cami her daughter has a great attribute of being so wise in gospel. They are a solid family and it'll be good to have them grow closer to God. We had Zone Training this Friday as well! Me and Elder Dunham gave a quick training on how to teach with understanding and resolving concerns that investigators might have. It was a neat experience and my first time training at zone training. We shared a story from the Book of Mormon about when Alma was teaching Zeerom (Alma 12) and we talked about how he was able to confound him and teach him wi understanding. We talked a lot about listening for the resolving concerns part. We played telephone with the whole zone and we talked about the importance of just listening and how we need to rely on the spirit to fully help people over come speed bumps. But ya, Zone Training was the best and we have a big zone so it's awesome. The West Jordan Zone is the bomb. lol. Also, I read this really cool talk on religious freedom this week and HERE is the address to it if y'all want to listen to it. It's by Elder Rasband one of the new apostles! It was a great talk about our role as citizens and talking about religious freedom. We picked up a lot of new people is week to start teaching so it's been great! Sunday was the cherry on top because I was able to bear my testimony three times at all of our different wards we cover. One of our appointments fell through after church so we went to Primary instead because their theme this month is missionary work and they wanted us to introduce it to all e kids. It was really cool and kids were really funny and this one Hispanic kid would say no to our questions while everyone else said yes. He was a funny dude. A lot of our lessons fell through afterwards but we were able to teach Jaiden a 13 year old from the new stake and we taught him the commandments and it went really smooth and he's a solid kid. His parents are active so it's been nice to have their support. He's going to get baptized on the 17th which will be awesome! He plays football and has no time for us to come over besides Sunday. It's been cool to teach him though. This evening was completely free so we contacted some referrals with no luck. Before we gave up finding people this one lady walked up and said Jesus wanted her to talk to us. We were like yes! We end up finding out that she is a member has been going to a LDS school but she was converted at the age of twelve. She asked us how to know when your forgiven? She still felt guilty for last mistakes. We talked about the Holy Ghost and how if you can feel the Holy Ghost constantly in your life then you know you are forgiven. It was awesome to talk to her and to see the Lord provide people at the right moment. That's my week in a wrap but ya today is a all day P Day so I have all day to email y'all which is awesome! We're gonna go to a BBQ for lunch but other than that we don't have too many plans for today! But I hope all is well with band, life, jobs, or whatever! I miss you guys! It's the most rewarding experience being on a mission! I love every second! This week has been great! We taught a ton of people this week and it was great! 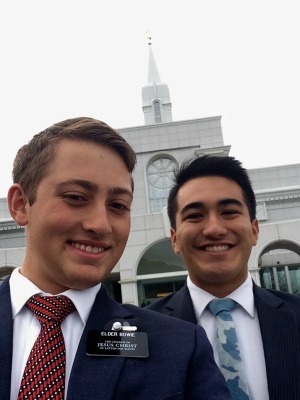 Our new Zone Leaders Elder Peniar and Vizzini are great and we went on exchanges Tuesday. They cover the YSA (young single adult) Ward in West Jordan and it was fun to go out with them. They are both from South Africa and they have some rad accents. Both of them are white and they are epic. We had our quarterly interviews with President Palmer, our mission president, on Wednesday at 11:30. One of our Elders in the District, Elder Hernandez, was sick this week and his companion Elder Leavitt had an interview as well so me and him went together to the interview. It's was cool and I really like President Palmer, we talked about how me and Elder Dunham was doing. He said that since Elder Dunham is leaving and that we are getting a lot of new missionaries next transfer that I might be training next transfer! That caught me off guard. He said that he felt like I was mature enough to do it, but it's crazy to think about it! But ya, besides the interview, we did a lot of work this week. We mainly just contacted a bunch of people in the new stake we picked up. We got a few new people to work with and that has been really good. We are meeting with this couple that live near to our apartments and they are doing good. 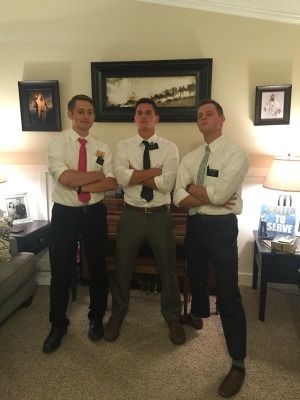 They are less actives and they want to come back out to church and get sealed in the temple. It's hard to believe that's been 2 1/2 months but I'm learning a ton out here! I'm glad that I'm out here in Utah! There are so many people out here that just don't have a fullness of joy in their lives. It's been a great experience to be able to help these people have happiness with their families and to help them draw nearer to God. I've been loving every second out here so far and it's gonna be the best two years! I hope y'all’s week was as good as mine was! This has been a great week! 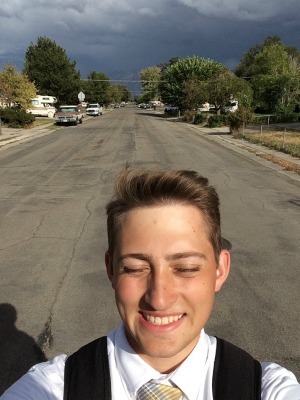 On Tuesday we walked down to the Stake Center to wait for the trio (Elders Kozakavitch, Soares, & Hurtado) to pick up Elder Dunham's bike because it had a flat, and we needed a ride to pick it up from the mission home. We met two guys along the way, Scott and Kevin. Scott needed help moving and Kevin just wanted to hang out later to talk with us. It was cool because after we got Dunham's bike we went over with the trio to Scott’s home and helped him out with some service. He told us that he was asked to leave his home and they gave him a very short time deadline to move out. So it was good for us to help him out by cleaning out this giant room of trash, and I found a trombone in the back and he let me take it. It's super old and not very good but ya I got a T-Bone now. It's not very good though. lol It's very hard to play on. taught her. We had Zone training Friday and it was a ballin experience . I learned a lot and I loved it! We talked a lot about the Temple and the Restoration of the Gospel of Jesus Christ. It was a good experience and I loved it. Saturday was the one of the best days of my life. I was able to baptize Josiah T.! It was the coolest experience and an amazing time doing it. Seeing their family come so far from missing so many simple things like having a supportive father, and for me seeing how they came from that abusive relationships just like a month or two ago and just seeing how far they have come from it and to see how the Gospel has changed their lives in so many ways. We helped them come back to church and now they can have peace. It is a wonderful feeling. I am so happy and proud for them. The mom gave her testimony after the baptism and she started crying as she told her past experiences over the past 2 months and how the Kearns 4th Ward has helped her so much and to have a family again. She started to cry and I was just overcome by the Spirit. It was amazing. I love their family and the spirit was so strong and the kids were awesome! I gave Josiah a big bear hug and it was awesome! It was the coolest experience ever and I felt like I actually worked with this family. It was just awesome! It was so epic! Yesterday at church was awesome! I got to bear my testimony in the 16th Ward and heard many great testimonies from members. One of them just recently had a daughter go to Vietnam and how this sister from our Ward went there with the first missionaries to open the mission there and in a few short weeks they have baptized many souls. Now the gospel is spreading like wildfire in Vietnam. Also, Sister T. gave her testimony and it really touched my heart. It was amazing to see her come so far in a short amount of time. I'm really happy for their family and I can't wait to see them be eventually sealed in the Temple. So ya, I love you guys and all the letters and emails you send! I love hearing from y'all! I hope your week was great as well! Transfers will be next week. So next Saturday I'll know if I'm staying or leaving Kearns. I kinda hope I stay but will see. I love you guys! .